Funfetti Whoppie Pies are an easy cookie-like treat thanks to a box mix and can frosting. 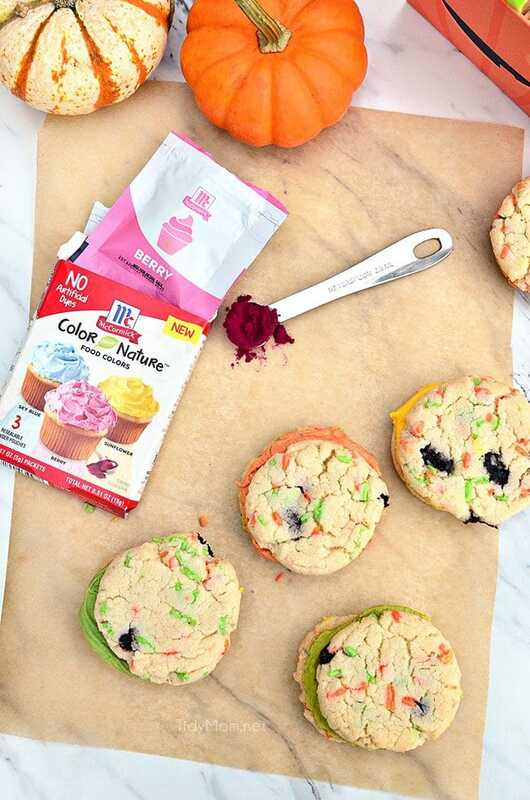 Add seasonal sprinkles and McCormick Color from Nature food color to frosting for a fun Halloween surprise. I love fall baking. Of course part of it is all the warm fall flavors and dishes, like pumpkin, apple, roasted sweet potatoes, chili, stew and so much more. But it’s also the fun colorful treats, in orange, yellow, green and black, to name a few. 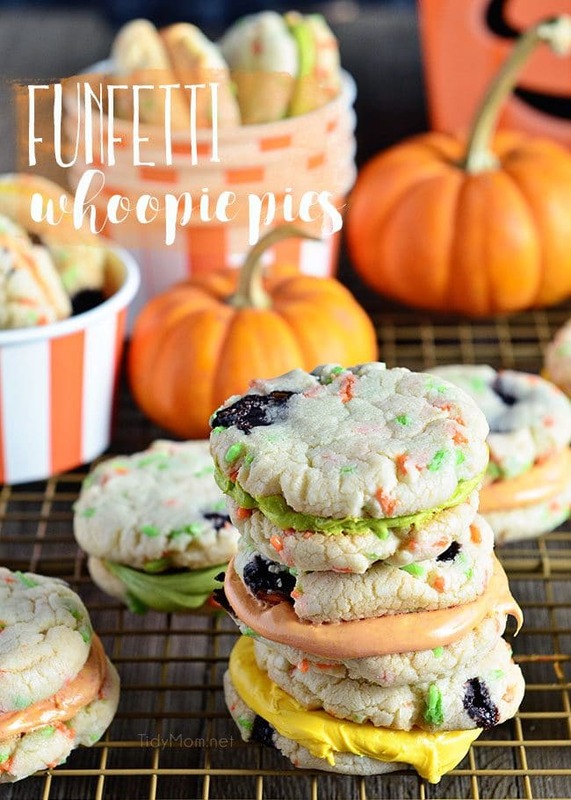 These funfetti whoopie pies are perfect for the fall season all the way through Halloween. But, simply change out the sprinkles and icing color and they would work for Thanksgiving, Christmas, or any time of year. If you aren’t familiar with a whoopie pie, it’s like a cupcake meets a cookie. Whoopie pies have cupcake frosting sandwiched between two cake-like cookies. Pure bliss I tell you! Unlike a cupcake, you get frosting in every bite. These funfetti whoopie pies are so easy and only require a few ingredients. You probably even have everything you need for the cake mix cookies; a box cake mix (I use french vanilla or white), a stick of butter, an egg and some sprinkles. Mix those ingredients with an electric mixer and roll into 1-inch balls. Use your fingers to press each cookie dough ball down a bit to flatten out a little before baking. While the cookies are in the oven, you can get the frosting ready. You can use can frosting, or your favorite buttercream frosting recipe. 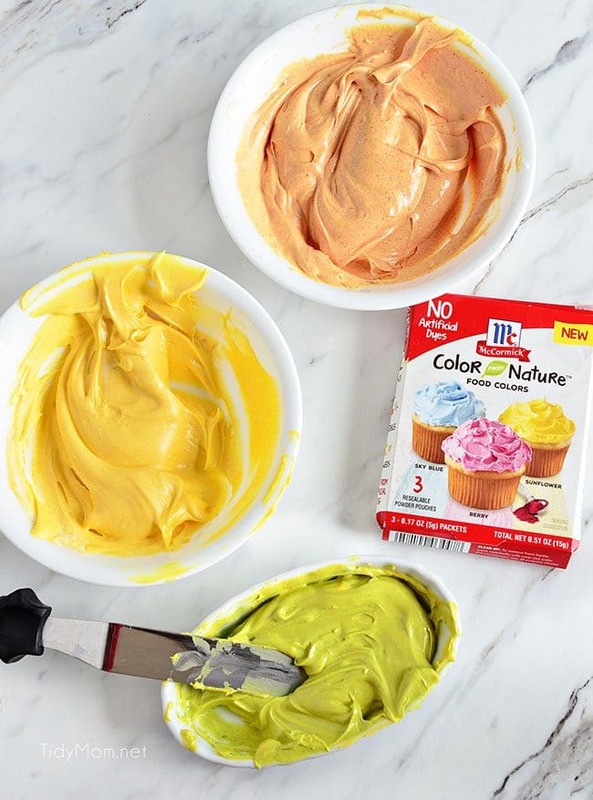 Evenly divide frosting into bowls to color. My friends at McCormick sent me their new Color from Nature Food Colors and I knew they would be perfect for these Halloween funfetti whoopie pies. I think you are going to love this food color as much as I do! Color from Nature colors are made from real plants, seeds and vegetables. They come in an easy to dissolve powder form that won’t thin your icing –I love that. Each package contains three resealable pouches, great for multiple uses and easy measuring, making it super easy to blend and achieve a wide range of beautiful colors. LIKE THIS FUNFETTI WHOOPIE PIE RECIPE? PIN IT! Funfetti Whoppie Pies are an easy and delicious cookie treat thanks to a box cake mix and canned frosting. Add seasonal sprinkles and food color to frosting. Using an electric mixer, combine the cake mix, butter, and egg until well combined and smooth (will be a thick dough). Add sprinkles to dough, and mix in. Using your fingers, press balls to slightly flatten. Bake for 10-12 minutes. Remove cookies from oven, and allow to cool completely on racks. Once cookies are cooled, frost the flat part of half the cookies then top with another cookie. Disclaimer: I have been baking and cooking with McCormick in my home for 30 years. I’m super excited to have a working partnership with them. As always, all opinions and views are all my own. 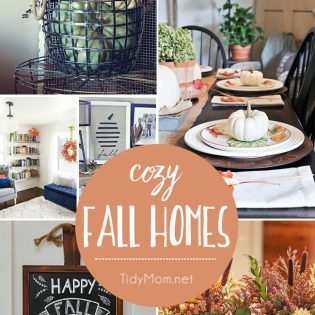 Thank you for supporting sponsors that allow me to create new content for TidyMom. These are so cute. Perfect for Halloween parties, and beyond. I love their products, the food colour is amazing! LOVE the thick layer of frosting nestled between two fun and festive cookies!!! Perfect! Ummm I’m obsessed with these!! Ooo! I need to find this collection of food colors! SO fun! I am loving these funfetti pies! Adorable! I love the colors!! So bright and fun! Thrilled to see natural food coloring! Loving these! Love that McCormick is making natural food colors now! 🙂 And these whoopie pies are perfect for fall. These are super cute- and I love the different colors of frosting…. makes them super festive! 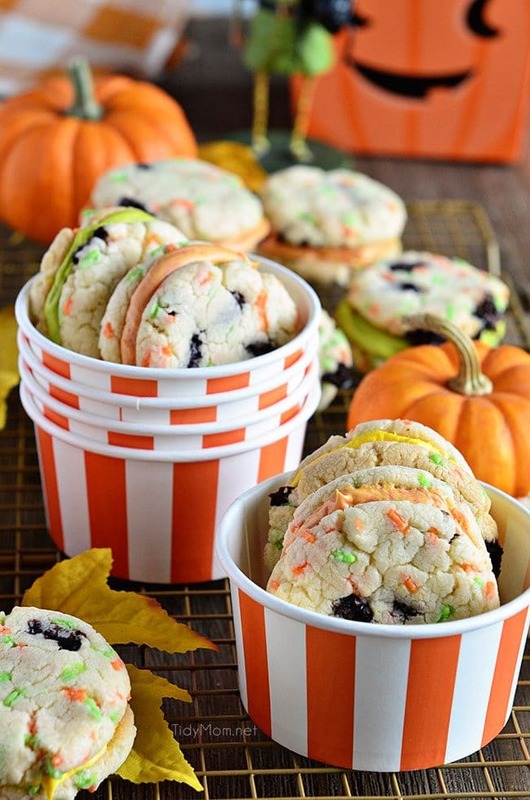 These cookies are so cute, and they look so easy! I love all the fun colors! I love the sprinkles in the cookies! 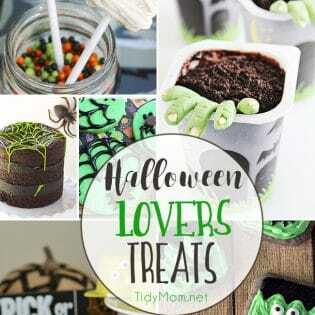 Perfect little Halloween treats! These would definitely satisfy a sweet tooth. The sprinkles are a fun idea! 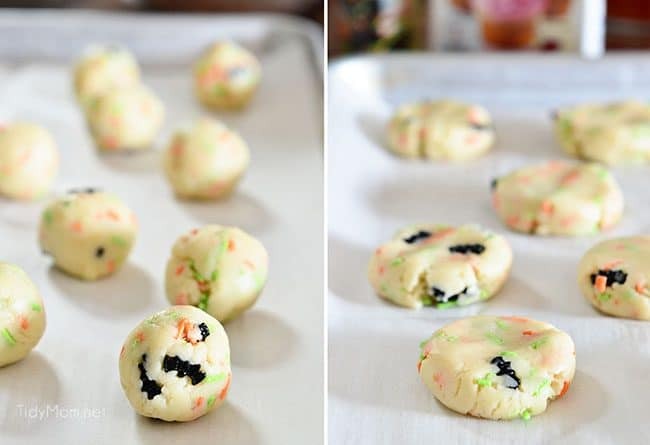 I made cookies like these a few years ago and they were amazing! Yours turned out great! 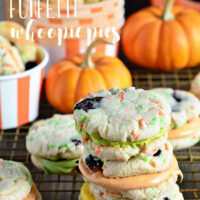 I have also made this whoopie and these funfetti whoopie pies are so easy, and only require a few ingredients.